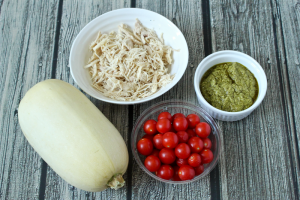 A hands-off, 4-ingredient spaghetti squash dinner that’s fresh and healthy! Happy Monday! 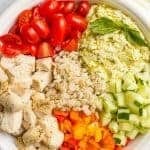 Here is an easy, 4-ingredient dinner that is going to be a little lifesaver. It’s very hands off. 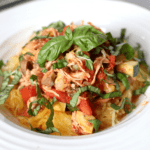 Most of the time for this recipe is the spaghetti squash cooking in the oven, leaving you free to do other things. Cause there’s always other things. This past week we had a random summer fever virus pass through the house. M had it first and hardly spiked a fever so I wasn’t sure what was the matter with her. She stayed home from school one day and helped Mommy work (or not so much, as may have been the case). Then a few days later I got the call and had to go get J from school because he spiked a 103 degree fever. He was fine otherwise and kept me company while I tried to get the bare minimum done for my job that day. Thankfully, they each recovered in 24 hours, and we were all healthy and happy by the weekend. But it made for a more challenging week. 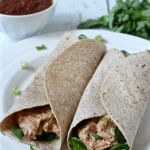 And this is one of my dinner go-to recipes on a challenging week. ‘Cause I want to eat well without a ton of effort. 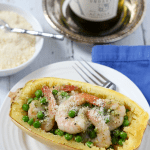 Next time you find yourself scrambling to get everything done and need more time to focus on anything but dinner, get your spaghetti squash in the oven and get back to life. This easy all-in-one meal has you covered. Prepare the spaghetti squash. Cut each squash in half lengthwise. Use a very sharp knife and be careful — they can be difficult to cut. If needed, poke it with a fork and microwave for 4-5 minutes to soften it slightly before cutting. Remove the seeds and inner pulp of the squash (much like cleaning out a pumpkin). 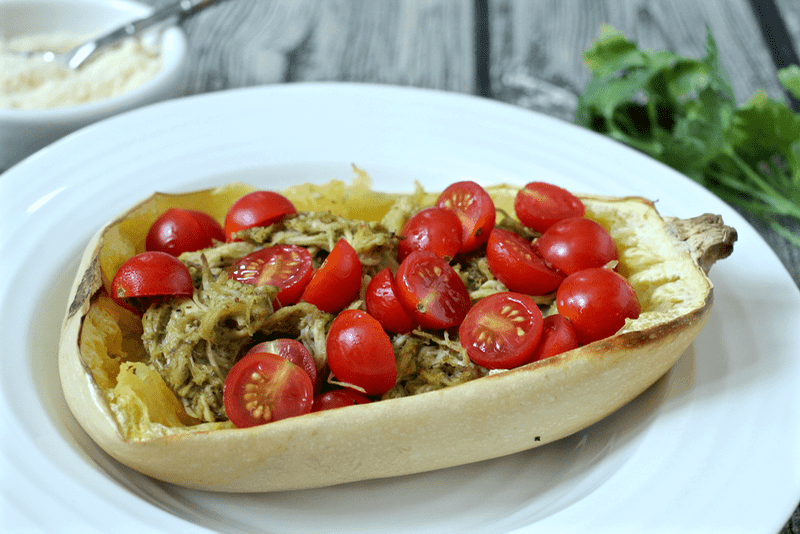 Place spaghetti squash cut side down on a baking sheet. 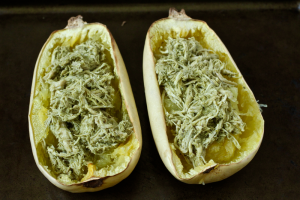 Bake spaghetti squash for 35-45 minutes, until squash is tender. The cooking time will depend on how large your squash are. You can test it with a sharp knife and see if it easily pierces the other skin. Don’t let them go too long though, because the spaghetti strands will be mush. Meanwhile, combine shredded chicken and pesto and stir well. 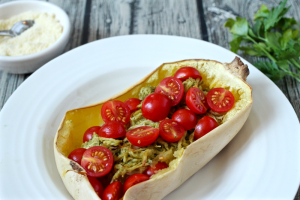 Remove the spaghetti squash from the oven. Use a fork to scrape the inside of the squash lengthwise to make strands that look like spaghetti. Just be careful - it’s hot! 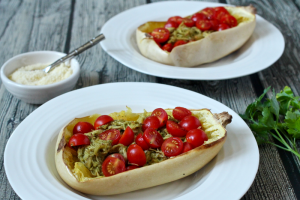 Add the pesto chicken to the top of each spaghetti squash boat. Return to the oven and cook for 5-7 minutes, until warmed through. Remove, top with the halved cherry tomatoes and serve, either directly in the spaghetti squash boat or transferred to a bowl. Oh man, this looks so good Kathryn! I am obsessed with these flavors. I need to get over my dislike for squash of all kinds. I think I am missing out on dishes like this! Thanks Susannah! 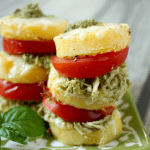 I’m obsessed with these flavors, too – pesto chicken and tomatoes just go so well together. 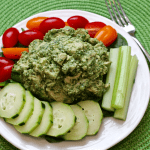 Pesto makes everything better, doesn’t it?! 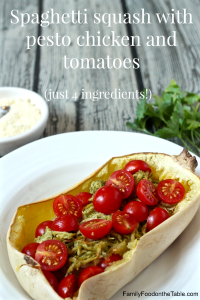 And while I love all squash, I especially love spaghetti squash. It’s just so cool how it comes out in those strands. Makes a great base for all kinds of yummy recipes. Hope you give it a try!